Sea urchins and sea cucumbers are highly sought after delicacies growing in popularity globally. The demand for these species is rapidly outpacing natural stocks, and researchers and seafood industry personnel are now looking towards aquaculture as a means of providing a sustainable supply of these organism. 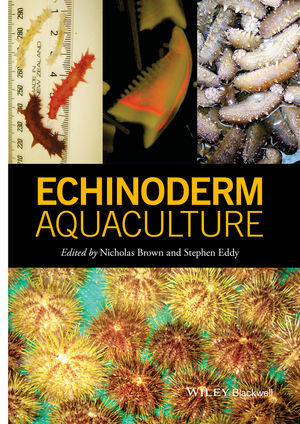 Echinoderm Aquaculture is a practical reference on the basic biology and current culture practices for a wide range of geographically diverse echinoderm species. Echinoderm Aquaculture begins by examining the basic ecology and biology of sea urchins and sea cucumbers as well as the breadth of uses of these organisms as a source of food and bioactive compound. Subsequent chapters delineate the specific species of interest invarious geographic regions from around the world. Together, chapters provide a comprehensive coverage of culture practices. Echinoderm Aquaculture is a practical reference for researchers and industry personnel, and will serve as an invaluable resource to this rapidly growing segment of the aquaculture industry. James P., Siikavuopio S.I., and Mortensen A.